To our valued customers, MINI of Santa Monica wishes to advise you of the following transportation options and nearby services and amenities available while your vehicle is being repaired or serviced. We encourage you to consider these options while we take care of your MINI. Coffee Commissary – Located right here inside our dealership, Coffee Commissary is a cafe serving up delicious coffee, teas, and other beverages. Coffee Commissary also offers a variety of food options. Live or Work Close By? 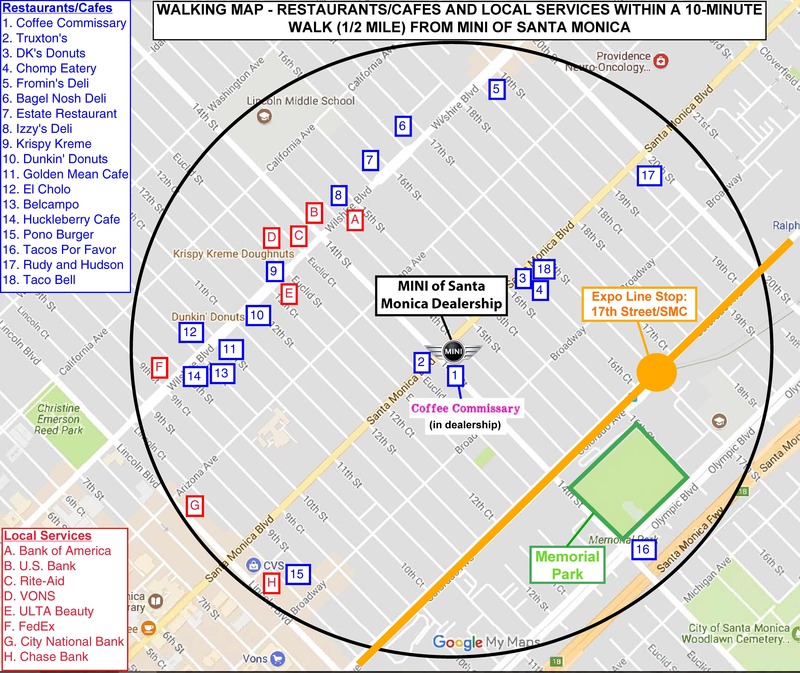 – If you live or work within a mile of MINI of Santa Monica, we are only a 20-minute walk from home or place of work. Our neighborhood is full interesting things to see while you enjoy a stroll home or back to work! 14th Street from California Avenue to Pico Boulevard features bicycles lanes on both the northbound and southbound sides of the street and additional bicycle infrastructure is located father North and South on 14th Street. Arizona Avenue and Broadway. 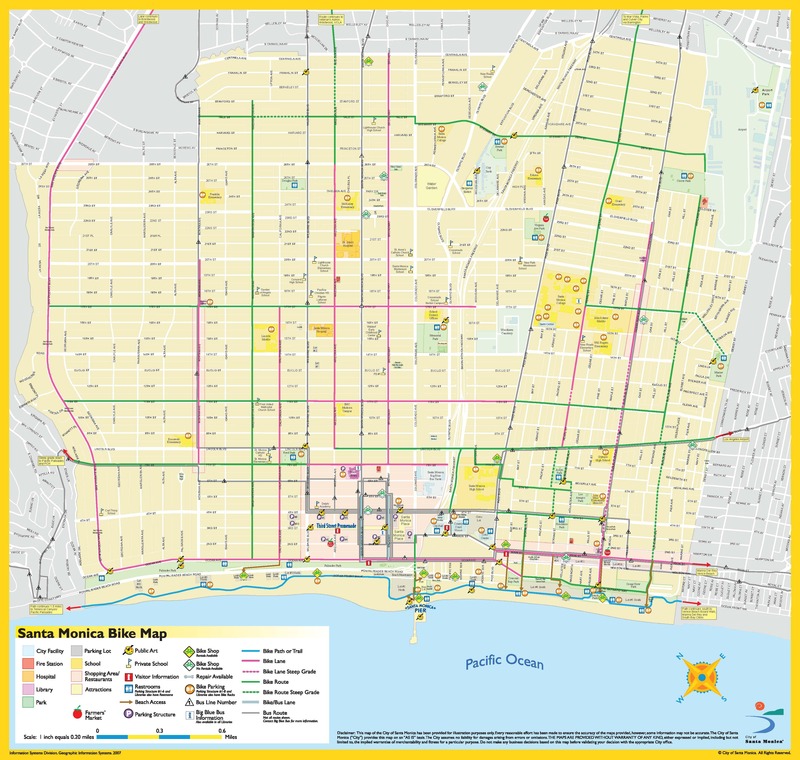 One block north of MINI of Santa Monica on Arizona Avenue and one block south of Broadway, there are bike lanes that run from Downtown Santa Monica all the way to the City’s eastern boundary at Centinela Avenue. The Expo Light Rail Line station at 17th and Colorado is located less than a 10-minute walk from us! And both the Santa Monica Big Blue Bus and Santa Monica L.A. Metro have bus lines that serve MINI of Santa Monica. Expo Light Rail – From its 17th Street Station, the Metro Expo Light Rail can take you to Downtown Santa Monica (approximately 4 minutes), Downtown Culver City (approximately 15 minutes) and Downtown L.A. (approximately 43 minutes)! Metro Bus – Metro Rapid Bus #720 has a stop at the intersection of Wilshire Boulevard and 14th Street (about a 6-minute walk) connecting you to Downtown Los Angeles, Koreatown, Park La Brea, Beverly Hills and Westwood all along Wilshire Boulevard.